In general most growers want their hydroponic setups to remain fairly sterile. This is because maintaining a sterile environment discourages problems such as algae growth and can eliminate bacterial and fungal problems even before they appear. This is especially important in recirculating hydroponic setups where algae can cause important nutrient balance issues within hydroponic solutions and root pathogens can spread very quickly across an entire hydroponic operation. Today we will be talking about one of the least invasive methods to maintain sterility within a hydroponic solution, UV light. This days hydroponic growers have access to a wide variety of in-line UV lamps that can be used in all hydroponic system sizes. An inline UV lamp like the one above - which uses 18 Watts of power - can be used to effectively sterilize at a 750 GPH flow rate and can therefore provide appropriate sterilization for even moderate system sizes of 200-300 gallons. 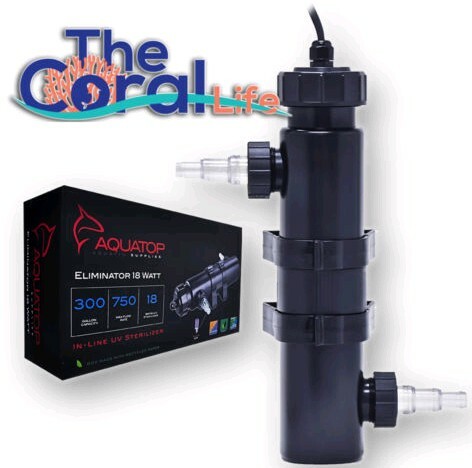 Larger inline setups also exist but if you cannot find them there is also no reason why you cannot use several of these - each one with its own pump - in order to maintain an even larger reservoir sterilized. Research has also shown that UV light sterilization is effective in reducing bacterial and fungal populations (see here). But this research also shows that the use of UV lights also affects native bacterial populations so if you're using any type of beneficial microbes these will need to be systematically replenished to compensate for their loss due to the sterilization system. There have been some reports of 99.99% of pathogen inactivation in water in hydroponic crops when using adequate doses of UV radiation, so this is definitely a good way to keep pathogens at bay, even if it can somewhat compromise root bacteria populations. Iron stability has also been an important concern in UV sterilization for a while. This is because UV irradiation of chelated iron species can destabilize and destroy the chelate, leading to non-chelated forms of iron that can much more readily precipitate from solution. The image below - taken from this article - shows the degradation of 3 different Fe chelates at pH values of a (3.0) and b (6.0) as a function of time. Note that the fact that free Fe is generated does not mean that the Fe is precipitated but merely that the chelate has been destroyed, which is the first step before the Fe can precipitate. 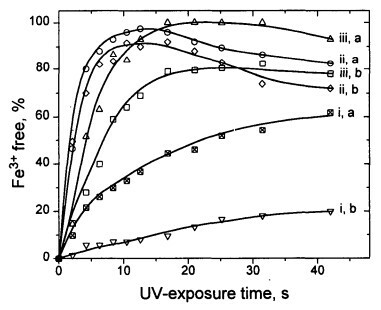 From this it is clear that different chelates have very different stabilities and in this case chelate i-Fe-EDDHA had the largest stability while other chelates had much poorer stability against UV radiation. In the end UV sterilization offers many advantages with only a few disadvantages if the formulation is properly prepared and the crop is properly managed. Fe depletion can be a problem if chelates like EDTA and DTPA are used but this problem can be alleviated in great measure by using a chelate like Fe-EDDHA. Micro-organism depletion from the roots can also be a problem if symbiosis are important for yields but this can also be alleviated by the periodic introduction of new beneficial microbe populations within the plant root environment. However UV is definitely not the only way to go for nutrient solution sterilization. There are other methods that can be used, some of which do not generate the problems that UV has - but different problems - and others that are less generic in their protection, implying that they must be somewhat targeted towards a particular pathogen in order to be effective. You can read this review about nutrient solution sterilization in hydroponics if you want to learn more before I post about these alternatives. Great article! One question, what is the source of the graph that shows the stability of the various chelates?